We're on a roll with new treats to sample. Today a friend dropped off a surprise for me. 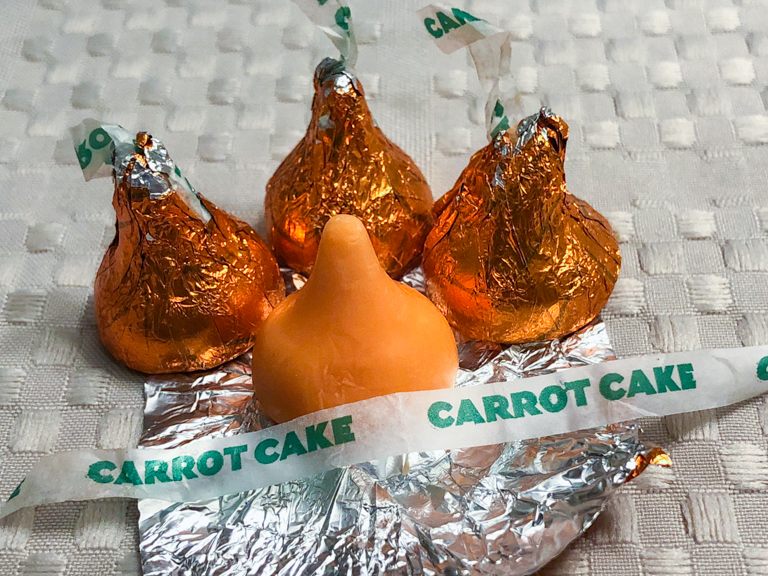 It's Carrot Cake Hershey Kisses! Could they possibly be as good as the Carrot Cake Oreos? We'll see. 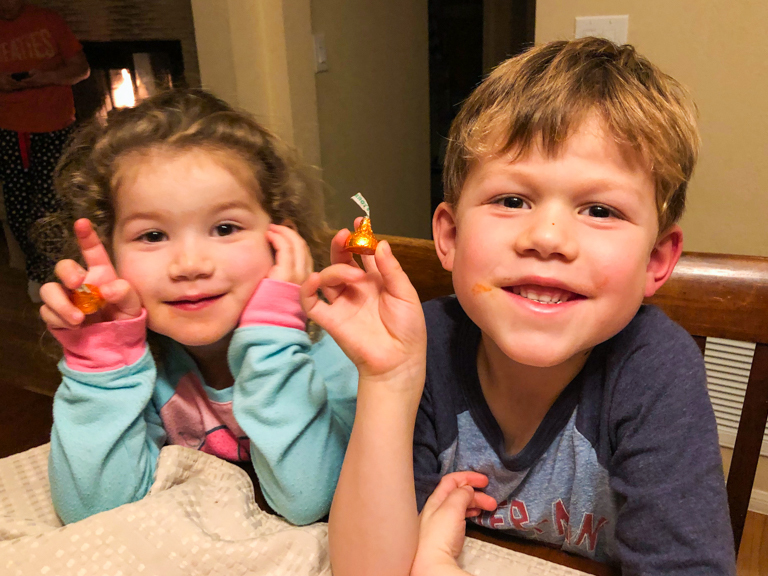 Dinner was spaghetti so that's why the kids both have orange mouths. 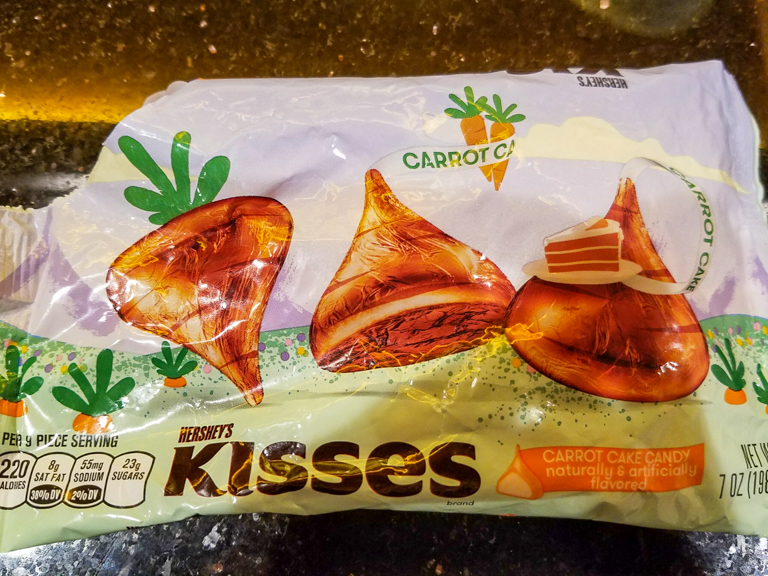 Cute packaging, treating the upside-down kisses as carrots. 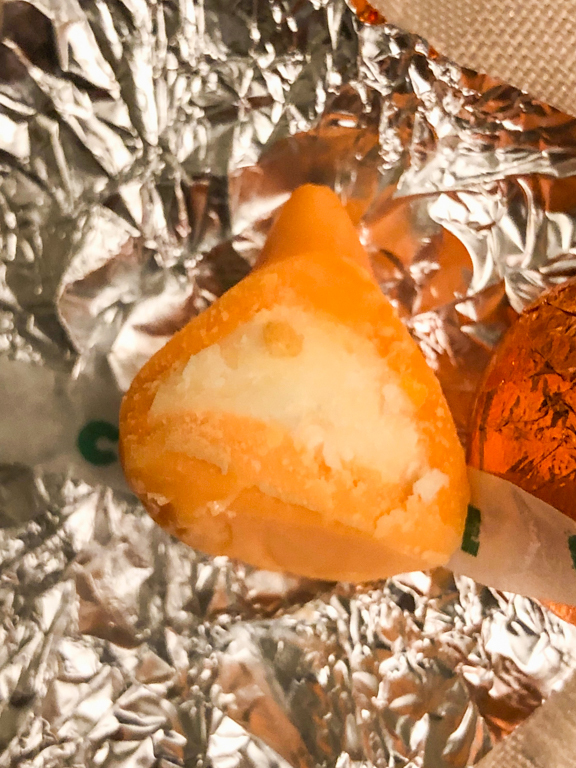 Looks like inside it's an orange colored white chocolate. I like how the paper plume is colored green, like the top of a carrot with the orange chocolate underneath. And inside there's what looks to be a white filling. Actually the package makes no mention of a filling, so I wonder if it's just uncolored chocolate. I couldn't tell if there was a difference in taste. If the Carrot Cake Oreos were everything a carrot cake should be, these were everything a carrot cake is not. Maybe because they're white chocolate, but I didn't like the texture of these. And the carrot cake flavor was very mild. I will pass on these in the future. Maybe the uncolored part was suppose to represent the "cream cheese" part of a carrot cake??? Must admit the packaging (outside package and each individual kiss candy) looks nice. Did everyone else vote thumbs down, too? The kids liked it, but they like anything candy. When I said it wasn't good, T decided to skip it. My friend who gave them to me, after I tried them, said they didn't like them either. I suppose the center is probably cream cheese, but yeah, I couldn't tell a flavor difference.